Though the term might sound dated, "middle-age spread" is a greater concern than ever. As people go through their middle years, their proportion of fat to body weight tends to increase — more so in women than men. Extra pounds tend to park themselves around the midsection. Visceral fat has been linked to metabolic disturbances and increased risk for cardiovascular disease and type 2 diabetes. In women, it is also associated with breast cancer and the need for gallbladder surgery. Are you pear-shaped or apple-shaped? Scientists are also learning that visceral fat pumps out immune system chemicals called cytokines — for example, tumor necrosis factor and interleukin-6 — that can increase the risk of cardiovascular disease. These and other biochemicals are thought to have deleterious effects on cells' sensitivity to insulin, blood pressure, and blood clotting. Insulin resistance means that your body's muscle and liver cells don't respond adequately to normal levels of insulin, the pancreatic hormone that carries glucose into the body's cells. Glucose levels in the blood rise, heightening the risk for diabetes. Now for the good news. Diet is also important. Pay attention to portion size, and emphasize complex carbohydrates (fruits, vegetables, and whole grains) and lean protein over simple carbohydrates such as white bread, refined-grain pasta, and sugary drinks. Replacing saturated fats and trans fats with polyunsaturated fats can also help. 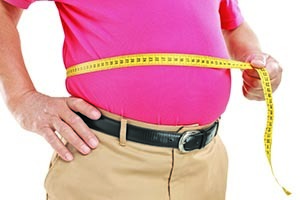 Scientists hope to develop drug treatments that target abdominal fat. For now, experts stress that lifestyle, especially exercise, is the very best way to fight visceral fat. Are sports drinks bad for you?